School board members and the public discuss possibly hiring a superintendent at the May 1 special board meeting. 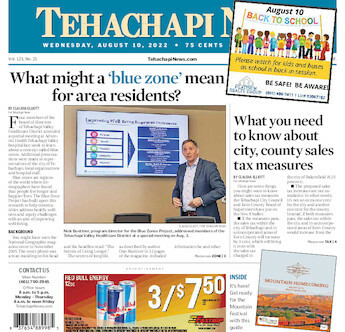 The Tehachapi Unified School District board discussed a path to hiring a new superintendent at its May 1 meeting, but made no decisions beyond agreeing to take up the matter again May 8 in the hopes of voting then to post the position. Board members posed several questions, and it became clear through their comments that time is of the essence. Among the questions board members asked at the special meeting: Why has the search waited until now? Should we look for a new superintendent ourselves or use an outside source? When should the job be posted online? What are the goals for the district? Can other stakeholders from the district be involved? How can relationships between board members be improved? “We are not making a quick decision," board member Carrie Austin said. Current Superintendent Susan Andreas-Bervel submitted a letter of resignation to the board on March 13; her contract ends June 30. The discussion on a search for new superintendent or interim was first put on the board agenda April 24. The board can post the job description online through edjoin.com, a posting tool hosted by the Kern County Superintendent of Schools Office. There was also discussion of considering hiring other entities such as the California School Boards Association, KCSOS, and Dave Long and Associates to help filter and bring in applicants. Some members had different opinions on a path of choice to begin looking for a new superintendent. Wood commented that stakeholders such as an ad hock committee should also be involved. Board member Paul Markham added that he would like to see a votable action item next meeting inviting entities to help in gathering candidates, so that the board can ask questions on how they can help in defining the timeline, qualifications of the superintendent, and other information. Board memberJoe Wallek advocated for hiring an interim superintendent and at the special board meeting on April 24, suggested Paul Kaminski, principal of Jabobsen Middle School, for the position. Kaminski was present at the May 1 meeting, but did not comment. President Leonard Evansic and board member Mary Graham had similar opinions. Graham added that if an outside entity was to be used, they have to define more goals for the district. Board member Jeff Kermode said a “solid interim” would be a good idea, a search should not be done directly by the district and that a date should be set for the next steps. There was also discussion that the board should work together to resolve differences in order to attract a good superintendent. Members of the public also had an opportunity to speak, even though that request to speak was initially denied by board president Evansic. Even though brochures and a posted draft of a document, speaking about the qualifications for the superintendent were listed on the agendia, an in-depth discussion did not follow.